Major Shrine: Basilica di San Nicola, Bari, Italy. Patron of: Children, sailors, fishermen, merchants, the falsely accused, pawnbrokers, prostitutes, repentant thieves, many cities. On this great festal day. Hail Nicholas the faithful say, Apostle of the Way. May we your presence feel, As our commitment is the same Answering Love's appeal. Young men to life restored. Sailors can rest, the sea is blessed, Your miracles record. In prison dark, your faith was strong; Help those who suffer wrong, We heed your words, the gospel call, To hail Christ, Lord of all. As Bari's pilgrims make their way To sing of your great name, The wonder myrrh of Myra still Proclaims your loving fame. Your prayers we now implore, As we praise God, the Father, Son And Spirit blest adored. Today, December 6, we celebrate the feast day of Saint Nicholas, Bishop of Myra (died 346), the inspiration for many of our current secular Christmas traditions. This great saint is the most frequently depicted saint in art (only Our Blessed Mother surpasses him), and the veneration and honor he is given throughout the world are testimonials to his holiness and of the glory which he enjoys with God. 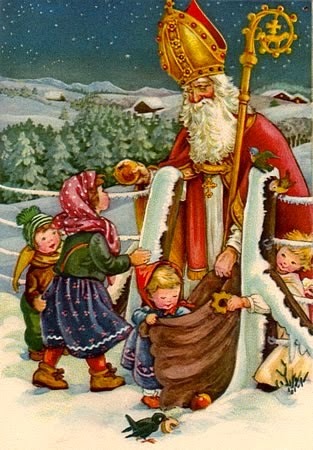 Little is known about the life of Saint Nicholas. That which is most reliable comes from a monk, Saint Methodius, Patriarch of Constantinople, who wrote a biography of Saint Nicholas approximately 500 years after his death. In his “life,” Saint Methodius tells us that that "Up to the present the life of this distinguished Shepard has been unknown to the majority of the faithful." He then describes the extraordinary events of the life of Saint Nicholas. The truth of many of these legends is unknown, but each speaks to a man of great faith. From this and other works, we know with certainty that when the See of Myra lost it’s bishop, Nicholas was chosen to fill the vacancy. There, he was recognized for his extraordinary piety, apostolic zeal, and became famous for working astonishing miracles. Nicholas was born at Patara in Lycia (Asia Minor), and demonstrated great piety and faith from an early age. For example, we are told that he fasted on Wednesdays and Fridays, taking only nourishment in the evenings. Per his biography, "He was exceedingly well brought up by his parents and trod piously in their footsteps. The child, watched over by the church enlightened his mind and encouraged his thirst for sincere and true religion". Sadly, Nicholas’ parents died when he was still young, and taking his considerable inheritance, devoted himself to works of charity. One of his most “famous” charitable acts is thought to have inspired the giving of Christmas gifts: A citizen of Patara, where he lived, had lost all of his money. This honorable man had three daughters to support, and could not find suitable husbands because of their poverty. Upon hearing of this situation, Nicholas took a bag of gold, and in the night, threw the bag in the open window of the man’s house. (Some say that the gold—also sometimes referred to as gold balls, rather than bags, landed in the socks and shoes of the family, drying before the fire. This led to the tradition of hanging stockings to be filled.) The man, using the money as dowry, promptly found a suitable suitor for his eldest daughter, who was married. Nicholas repeated the act twice more, once for each remaining daughter. However, the man kept watch, and upon recognizing Nicholas, was overcome with gratitude and thanks. From this, we see Saint Nicholas as a holy man, charitable, and giving of himself to others. Under the rule of Emperor Diocletian, Nicholas was imprisoned for his faith, but refused to recant, and was eventually freed upon the death of the Emperor. He is recorded as makinga "glorious confession" of the faith to his jailors, converting many. Saint Nicholas died at Myra, and is buried there in the basilica named for him. At Myra "the venerable body of the bishop, embalmed as it was in the good ointments of virtue exuded a sweet smelling myrrh, which kept it from corruption and proved a health giving remedy against sickness to the glory of him who had glorified Jesus Christ, our true God." During the Saracen occupation, the relics of Saint Nicholas were translated to Bari, Italy. The translation of the relics did not interrupt this phenomenon, and the "manna of St. Nicholas" is said to flow to this day. This “manna”-- a unique relic which forms in his grave, is a liquid substance said to have healing powers. It was one of the great attractions which draws pilgrims to his tomb from all parts of Europe. An anonymous Greek wrote in the tenth century that, "the West as well as the East acclaims and glorifies him. Wherever there are people, in the country and the town, in the villages, in the isles, in the furthest parts of the earth, his name is revered and churches are built in his honor. Images of him are set up, panegyrics preached and festivals celebrated. All Christians, young and old, men and women, boys and girls, reverence his memory and call upon his protection. And his favors, which know no limit of time and continue from age to age, are poured out over all the earth; the Scythians know them, as do the Indians and the barbarians, the Africans as well as the Italians." As a bishop, Saint Nicholas, was first and foremost a shepherd of the people, caring for their needs. His active pursuit of justice for his people was demonstrated when he secured grain in time of famine, saved the lives of three men wrongly condemned, and secured lower taxes for Myra. He taught the Gospel simply, so ordinary people understood, and he lived out his faith and devotion to God in helping the poor and all in need. Regardless of the accuracy of the legends and miracles reported in his name, the life and deeds of Saint Nicholas, and the attitude with which he praised the Lord, make him an inspiration to us today. As we move through Advent, toward Christmas, let us emulate Saint Nicholas in our care and concern for the welfare of others.